This project is my attempt to build a low-cost scanning tunneling microscope (STM) capable of atomic resolution imaging in air. The piezo scanners typically used in STM typically cost at least hundreds of dollars. Some time ago I came across John Alexander’s simple STM project, in which he used a cheap piezo buzzer element with one of the electrodes cut into quadrants to enable XYZ motion. This type of scanner is less rigid than what is usually used for STM, but I decided to give it a try and see how far I could get with it. Turns out I was able to image highly-oriented pyrolytic graphite (HOPG) with my STM with atomic resolution! The image below shows the hexagonal lattice structure of graphite. STM is a tool capable of imaging surfaces with atomic resolution. In STM, a sharp metallic needle is brought within a few angstroms of the surface of a conductive sample and a small bias voltage is applied across the gap. If the gap is small enough (<1 nm), electrons can cross the gap via quantum tunneling. This “tunneling current” is typically in the pA – nA range, and can be measured with a transimpedance amplifier. The STM tip is mounted on a piezoelectric scanner, which is capable of sub-angstrom motion in all directions. The tunnelling current measured by the transimpedance amplifier is fed into a feedback loop which controls the voltage applied to the Z-axis electrode of the piezo scanner and acts to maintain a constant tunneling current, and therefore a constant tip-sample distance. The X and Y axes of the scanner are used to raster scan the tip across the sample. By measuring the Z-axis voltage as a function of scan position, an image of the sample topography is constructed. If the tip moves closer to the sample surface, the tunneling current increases exponentially. This exponential relationship is what makes STM sensitive enough to resolve individual atoms, even under ambient conditions. If the STM tip is atomically sharp (not as hard to achieve as you might think!) then nearly all of the tunneling current will flow through the single atom on the tip which is closest to the sample surface, resulting in images with atomic resolution. I’m building a STM project based on yours, and it’s almost finished. The major component changes I made were using LTC2326-18 instead of LTC2326-16 (which wasn’t available), replacing OPAX227 with TL07X and using a Teensy 3.6 (which runs on 3.3V) for MCU. The only thing different in the Arduino code are the pins. When I turn on the PC software the board is detected and by turning the micrometer screw the tunnel led goes on. I could only get grey noise in the images, though. First, there was a spaghetti-like noise, which disappeared when I used a battery powered laptop. But then there’s still just noise in the image. I guess maybe the approach is too coarse, but I don’t know for sure. Do you have any ideas on this? Nice job! I’ve also been using TL07X op-amps without issues. Your “spaghetti-like” noise is 60 Hz mains pickup. It’s best to shield the STM and preamp with a metal cover to eliminate this and any other noise pickup by the preamp. Some of your screenshots show thick bright bands in the tunnel current images, meaning the tip is probably crashed there. They also all show a 10 nm scan size, have you tried increasing it to 1000 nm or so? Starting with a large scan will be much easier, and will make it easier to figure out what’s going wrong. Maybe your sample is pretty flat over 10 nm, and the noise your seeing is from vibrations. A larger scan will show some structure in the sample surface. Regarding the approach, it looks like you’re able to get it into stable tunneling with the feedback loop running, so I wouldn’t worry too much about that yet. You’re almost certainly crashing the tip during the approach though. Does the sample rotate when you turn that micrometer screw? It looks like a differential, so I’m guessing you’re using the fine adjustment for the final approach? Thanks for the quick reply! I will try increasing the scan size and see if it helps. The sample does rotate. By the way, the sample is put in there by attaching a piece of tape to the graphite sample, dettaching the tape, then attaching and dettaching it to the copper plate. The handle is from a micrometer (the measuring instrument), so there’s just one kind of adjustment available (the smallest division is 0.01mm). Just a quick note: For low frequency shielding you are better off with a magnetic shield, as the skin depth for non magnetic shield like copper or aluminum at 50 or 60 Hz is ridiculous something around a cm. I used a big steel electronics enclosure for my STM in graduate school setting the whole microscope inside and closing the lid after approaching the sample. Till around 1987 all STMs had analog feedback loops for Z servo. 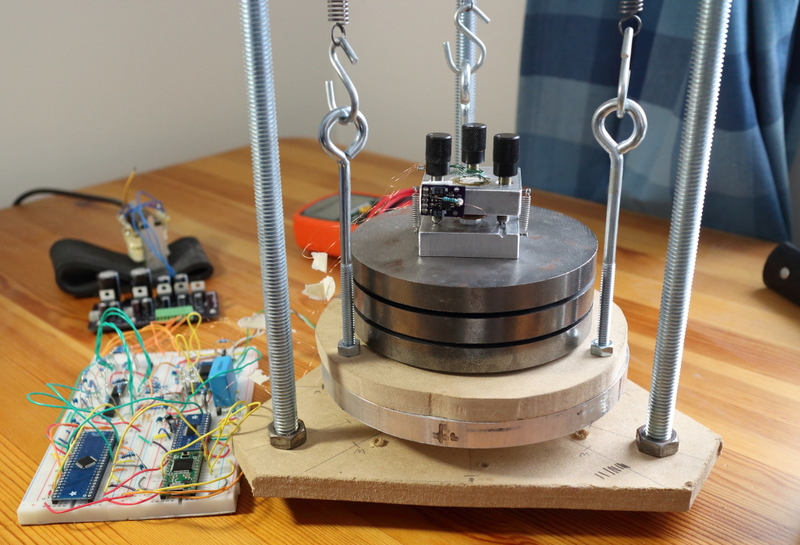 My old website “Simple STM Project” uses an analog servo for Z just using potentiometers to adjust the servo gain/time constant. I was not seriously trying for atomic lattice resolution; I was trying to demonstrate how a simple, inexpensive and safe (no high voltage) STM could be made. The circuit is similar to what I used back in 1986 on my first STM (a tube scanner with high voltage amplifier) where it had no problem getting nice graphite lattice resolution. Dan Berar’s mechanical design looks much more rigid than my simple STM design. That should help in immunity to mechanical vibration especially at the small scale. Even commercial AFMs and STMs imaging very flat samples without an acoustic enclosure will show noise when people talk in the same room as the microscope. I am currently working on a similar project myself, but with an analog feedback loop. I saw that your early prototype used an analog feedback loop. Did you get any usable images with that design? Do you know of other DIY SPM projects which also use this aproach? Absolutely, changing the feedback loop to digital had no noticeable effect on the image quality I was getting. The first atomic resolution images I took with HOPG were with the analog feedback loop using just an integrator and a potentiometer to adjust the gain. In fact, it can have particularly low noise because it’s so simple and you don’t have to worry about extra noise and glitch impulses from a DAC, though the main limiting factor seems to be vibration/sound as John Alexander mentioned above (or possibly DAC glitches, I’m still not really sure but I can’t seem to get below ~20 pm or so Z-resolution). Take a look at his simple STM page, he also used an analog feedback loop. Thank you very much for your response, It gave me a boost of confidence in my project!. A few weeks later, I’m now at the point where I can pull images from the STM! So far they have not been able to capture very much detail, but they do seem to show some surface features! There is a lot of room for improvement in my mechanics, so I’ll be working on that next. Doing my approach is pretty much impossible without crashing the tip, and I often get it to resonate so that the tip repeatedly hammers against the sample. Your blog has been a great resource and is the reason I started this project, Thank you!